For the past three decades or so, the conventional wisdom has been that drinking alcohol at moderate levels is good for us. The evidence for this has come from many studies that have suggested the death rate for moderate drinkers is lower than that for non-drinkers. In other words, we thought moderate drinkers lived longer than those who didn’t drink at all. 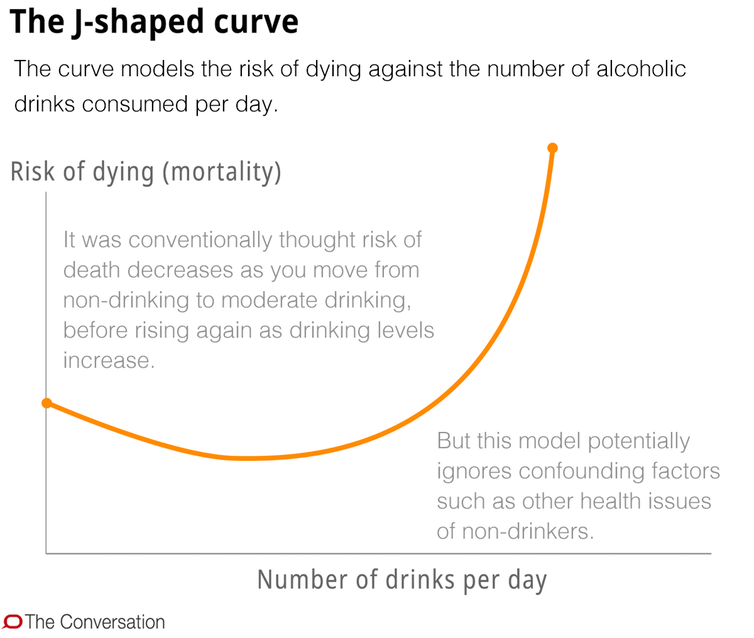 This phenomenon has been communicated with great impact by the J-shaped curve that shows death rates fall as you move from non-drinking to moderate drinking, before rising again as drinking levels increase. More recent studies have been able to address this challenge of separating out the effect of drinking on health, independent of other confounding factors. And these newer studies tell us moderate drinking is probably not good for us at all. Instead of the J-shaped curve described previously, the most recent evidence is showing a curve that continues on an upward trajectory. Most of us embraced these studies with enthusiasm. But the findings were probably too good to be true. The problem has always been the potential mixing of many other variables – called confounding factors – with drinking. The concern was that non-drinkers as a group in many of these previous studies were different to moderate drinkers in many ways in addition to their drinking. Non-drinkers may have been unhealthier to begin with (hence not taking up drinking in the first place) or they may have included recovering alcoholics with poor health. These confounding factors may have made moderate drinkers look healthier than they actually were (relative to non-drinkers) and thus have led us to associate moderate drinking with better health. As you increase your level of drinking beyond not drinking at all, for all levels of drinking, your health outcomes worsen. The curve starts off relatively flat, before rising dramatically, indicating much higher rates of early death as drinking levels increase. So what is the health cost of moderate drinking? If we look a recent Lancet study that addressed this issue, we can start to make sense of this cost. This suggests that if you drink one alcoholic drink per day you have a 0.5% higher risk of developing one of 23 alcohol-related health conditions. But risk expressed in this way is difficult to interpret. It’s only when we convert this to an absolute risk that we can begin to understand the actual magnitude of this risk to our health. It translates to four more illnesses* per 100,000 people due to alcohol, which is actually a pretty small risk (but an increased risk nonetheless). So for you as an individual, what does this new evidence mean? Maybe it means having to lose the contentedness you have felt as you drink your evening glass of wine, believing it was also improving your health. Or maybe this new evidence will give you the motivation to reduce your drinking, even if you are only a moderate drinker. Of course, if you get pleasure from drinking responsibly, and you have no intention of changing your drinking habits, then you will have to consider and accept this potential cost to your health. But remember, the evidence is still incontrovertible that drinking high levels of alcohol is very bad for you. It will shorten the length of your life and affect the quality of your life and those around you. 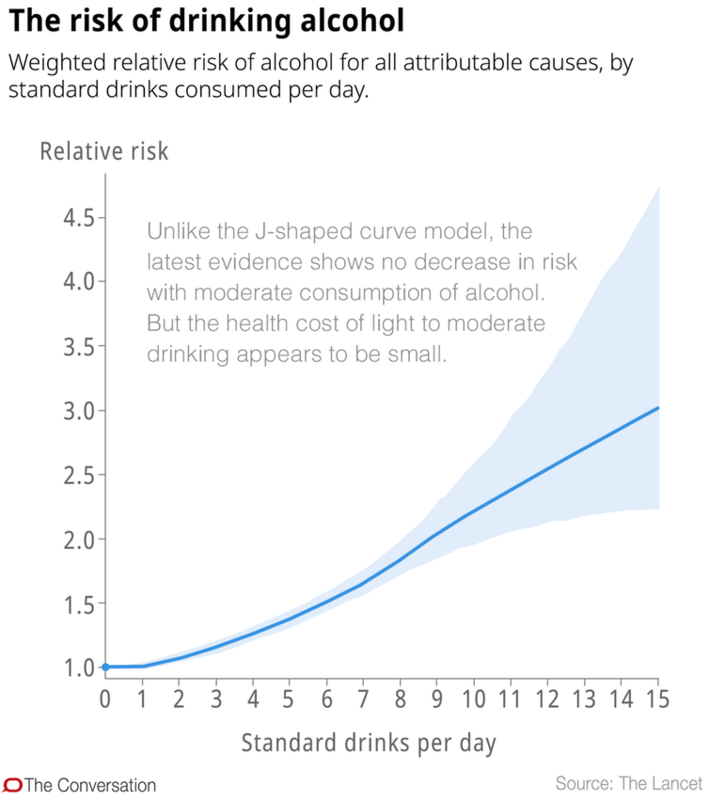 This risk estimation assumes several things, including that you drink alcohol every single day, so you would expect the risk to be smaller for those who drink every other day or only occasionally. The latest evidence suggests the health cost of light to moderate drinking, if there is one, is quite small. What was previously thought to be a marginal benefit of moderate alcohol drinking is now considered a marginal cost to health. The alcohol industry’s new rules to protect minors from their alcohol advertising is proven to be woefully ineffective and nothing more than pure deception.